The majority of collisions between motor vehicles and pedestrians or cyclists occur on high speed arterial streets and at intersections. Improving the safety of pedestrian crossings can help to reduce vehicle speeds, separate pedestrians and vehicles, and increase pedestrian visibility. On wider roads with heavier traffic flows or on streets where low speed limits are not feasible, the focus should be on designing safe crossings. Intersections with high traffic volumes or poor design can overstimulate drivers and make it difficult to notice pedestrians. 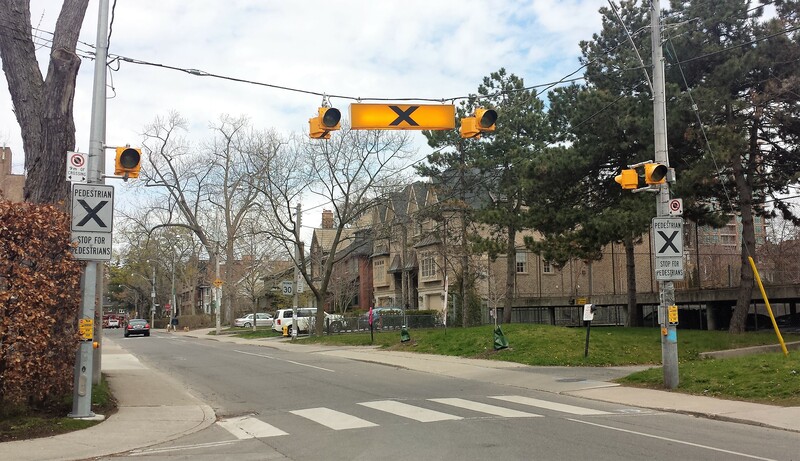 A recent analysis of crash data in Toronto found that the majority of pedestrian collisions occurred at intersections, and usually the pedestrian had the right-of-way.